New discoveries are important for growth. Recently I have begun a series of paintings using a palette knife. Using a knife to paint with rather than a brush provides for a very different application of paint. Different textures emerge along with different shapes and unblended areas of color. It's exciting and a little unpredictable- all good things when it comes to making art. 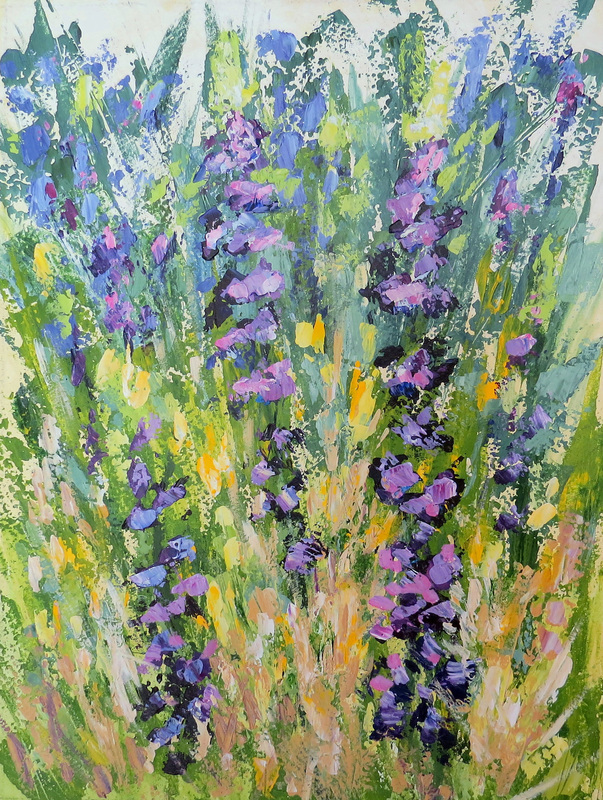 9" x 12" acrylic on wc paper-matted to 12" x 16"
Inspired by the lupines and other wild grasses along the side of the road that runs to the lake where I take my walks. 8" x 10" acrylic on wc paper-matted to 11" x 14"
Inspired by the fields and views at Lake Hogan, early winter. Winter at the Calaveras river brings all sorts of beautiful color. The river can start to flow again and there is a kind of algae floating across some parts of the water. I hoped to capture a slice of those things with this piece. Though this scene is familiar to me, it is different in every season. With winter approaching and a storm on the horizon, the atmosphere seemed nearly "blue" to me. I tried to hold onto that idea while making this piece. At the end of our street is a small lake. As a confirmed suburbanite recently relocated to the country, a lake that is practically in my own backyard is rather fantastic. The trees and brush form a little hideaway that just down the road. this piece is based on a little slice of what I get to see on a daily basis right at home during this time of year. We are very fortunate to have a little bit of acreage on which to live. Towards the back of the property there is a tangle of bushes, trees and grasses. It is not an area that is closely maintained and so everything grows a little wild. Though I only get back there occasionally, there always seems to be something to inspire me. A lovely little creek runs through the middle of downtown Chico, CA. Stepping into the area where the water flows is amazing. There is the strangest sense of space where the reflections on the still water lead you to believe that you are surrounded, almost enveloped, by the creek environment. The eyes tune in to the reflections of the shapes on the water and then back to the creek bank. Up could be down as the sense of horizon is lost. I hoped to capture a little of that idea with this piece. Much of what occurs in the natural world is repetitive yet exciting each time. The momentary coming together of the water and the rocks and the subsequent action is one of those occurrences. In this river it happens daily but was new to me as the observer. 8" x 8" acrylic on paper-matted to 12" x 12"
Inspired by a very full Lake Tulloch and the way south on highway 49. 9" x 12" acrylic on paper-matted to 12" x 16"
Inspired by the Calaveras River along Hogan Dam Rd. Inspired by Chico Creek in Bidwell Park, Chico, CA. The river by my home has an entirely different feel to it during the winter. On this particular day I was attracted to the gray and blue notes in the water which was reflecting the drama in the sky overhead.